These companies consistently exceed customer expectations! When it comes to selecting a home security company, it is not just about who has the best equipment or the lowest prices – customer service counts for a lot. You are establishing a relationship with a company that will be there to help protect your family when you need it most. When considering a home security company…service after the sale is an important factor which separates the good from the great.Each of our listed security providers has distinguished themselves within the industry for providing superior customer service. The home security companies with the best customer service typically offer warranties that extend past the normal 1 year warranty offered by the manufacturer. Look for either a lifetime warranty or at least a warranty that covers the initial term of the contract. The best security companies offer some flexibility in monitoring contract terms. While 3 year agreements are the industry standard, top alarm companies for customer service go the extra step might offer shorter term options such as a 1 year agreement. Make sure you inquire about escalation and auto-renewal clauses. Alarm companies that excel in customer service will make it easy for you to relocate the systems if you should need to move. If you are looking at a local company, be sure you understand your contractual obligations should you relocate outside their service area. Home Alarm Companies with superior customer service will typically have an A BBB rating. While it is not possible to please everyone, top notch customer service companies will do their best to resolve customers issues. Positive BBB ratings will reflect that. Home Security companies that are committed to customer service provide prompt response to customer issues. They offer multiple options for support such as phone, e-mail and chat. Most of the best customer service companies offer a 14-30 day return policy. 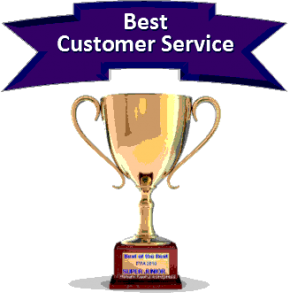 The best security customer service companies require no restocking fees and even pay the shipping for returns. 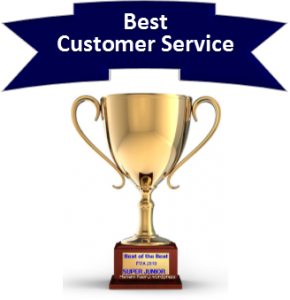 World Class Customer Service– Year after year, Frontpoint is recognized for their commitment to providing best in class customer service. Their A+ BBB rating validates the internet reviews that praise them for consistently exceeding customer expectations. As a matter of fact, 94% of their buyers would definitely recommend them. They feature a low key, consultative sales approach and contract flexibility-with both one and three year agreements available. 100% Wireless- Frontpoint provides reliable, name brand equipment set up using 100% cellular monitoring. This eliminates the possibility of phone lines being cut and provides secure,reliable transmission of signals and data. State of the Art Monitoring Capabilities – In addition to their extensive menu of available security, surveillance and home automation products, Frontpoint delivers technologically advanced solutions as part of the Interactive monitoring services. Powered by Alarm.com, Frontpoint solutions incorporate “Crash and Smash” protection as well as Geo-Location Solutions. The first one makes sure that monitoring company will be notified even though the system is destroyed…and the second makes it possible for innovative system automation capability dependent on GPS cellular locations. Transparency and Integrity– Unlike many home security sites, with Frontpoint, costs are clear-and there aren’t any tricks or hidden charges. There are no escalation or long term auto-renewal clauses hidden in the contracts. And they even give you an option of a shorter term one year agreement. Unbeatable Return Policy- Frontpoint is so confident in the quality of the products and services that they provide that they back it with a 30 Day Money Back Guarantee, with NO restocking fees and they even pick up the tab on return shipping! 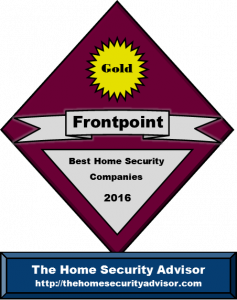 Frontpoint has long been recognized for proving the best customer service in the home security marketplace. They back your equipment with a 30 Day Full Money Back Guarantee and offer a complete equipment selection that features surveillance cameras as well as energy management. Get more details in our Frontpoint Security Review or give them a call for a free, no obligation quote. Exceptional Track Record for Outstanding Customer Service – Although these folks might not be a household brand (yet), Link Interactive is undoubtedly carving out a position in most Top Five Best Home Security Company lists. Link Home Security is the DIY alarm division of Mountain Alarm. They are a regional security provider which has an A+ BBB ranking as well as Sixty years’ experience with the sales and installation of home security systems. They enjoy a 98% client approval score. Even more incredible is the fact that they have no complaints lodge against them through the BBB! And..they offer more than just great customer service. Straightforward, Competitively-priced Monitoring Fees – Along with extremely aggressive monitoring terms, Link Home Security keeps it very simple in terms of their packages. Their “basic” Gold Plan includes cellular monitoring, all Alarm.com interactive services and full home automation for one low price-$30.99 a month. Want video? No Problem…just $10/mo. More. For an in depth analysis, read our Link Home Security Reviews or get a FREE Quote and get details about the reasons why Link Home Security is considered one of the best home security companies of 2018. They start by making it affordable and eliminating most of the up-front expense. But, just as important…they show their commitment to customer service by protecting the system with a Lifetime Equipment Warranty on their security equipment. That’s right….as long as you are monitoring your system with Protect America, you will never have to worry about the cost of replacing the equipment. And they don’t stop there.. they protect the price of monitoring your equipment with their Rate Lock Guarantee. This locks in the rate for your service as for as you are a customer. And once your original agreement is satisfied, you continue on a month to month basis…with NO long term renewal clauses. Protect America provides more than twenty years of expertise in providing stellar customer service to more than half a million users. $0 Up Front Fees -Get as much as a $1400 value of hardware without any up-front expenses! Inexpensive Basic Monitoring Rates– IProtect America features monitoring prices for as little as $19.99 /mo. Rate Lock – Protect America pledges that your rate will always be exactly the same. Best Price Guarantee – Locate a lower price on the very same system and they’re going to meet or beat it! Protect America has provided an outstanding value and great customer service for over 20 years. They provide FREE equipment packages, without up-front hardware expenses, a number of monitoring alternatives, Best Price Guarantee, Lifetime Warranty as well as first-rate customer support. If you are looking for quality customer service and an outstanding overall value, Protect America delivers!